With 3 bedrooms and 3 bathrooms, Sapphire Beach #407 is a great rental for couples or friends traveling together. This oceanfront apartment has lots of updates, including a modern kitchen and cable TV. Relax inside and enjoy the water view, or head out to the private balcony for evening drinks. The complex comes with two pools, a fitness center, and much more, and you will love the easy access to St. Lawrence Gap for dining out and shopping. 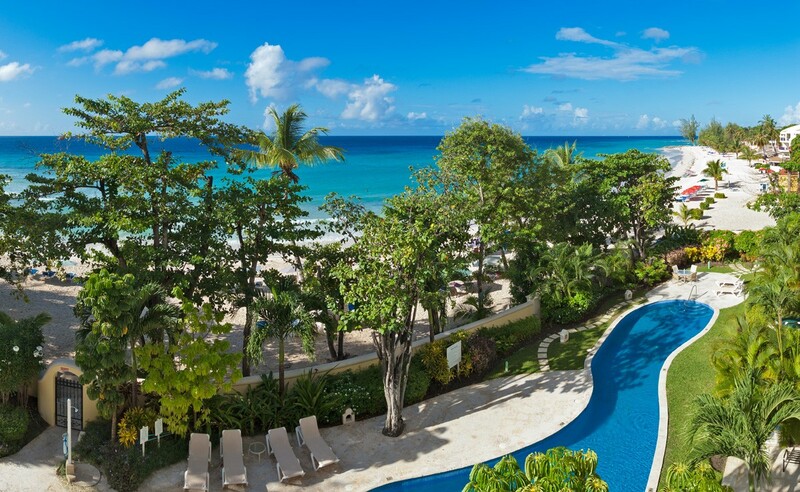 Spend your days lounging poolside, snorkeling at the beach, or enjoying the vibrant Barbados culture in town. Overlooking the white sands of Dover Beach! Ideally situated on the fabulous Dover Beach and enjoying stunning ocean views, Sapphire Beach is within walking distance of the many amenities and restaurants located in St. Lawrence Gap. Facilities at Sapphire Beach also include two swimming pools and a fitness center. Sapphire Beach #407 is located on the fourth floor of this impressive beachfront development and enjoys wonderful views of Barbados’ South Coast and the stunning blues waters of the Caribbean Sea. This rental condominium features an open plan living area adjacent to the well-equipped kitchen and is attractively furnished with turquoise accents complementing the furniture. The living area opens out onto the balcony overlooking the pools and the white sands of the renowned Dover Beach. This is a favorite spot to start the day with breakfast or to end the day watching the sun set. The master bedroom is decorated in cool blues and neutral tones, and has a king-size bed with an en-suite bathroom. It also enjoys direct access to the balcony through large patio doors. The spacious second bedroom also has a king-size bed and en-suite bathroom while the third bedroom has twin beds, and a bathroom across the hall. For those wanting to stay connected, the unit is well-equipped technology-wise, with a 40-inch flat-screen TV in the living room and a 32-inch flat-screen TV in the master. Best of all, Maid Service is provided twice per week during your stay! Good for stays from Sep 2, 2019 to Sep 22, 2019.